A magnitude 5.7 earthquake was recorded Friday afternoon in the Pacific Ocean, about 135 miles west of Ferndale, on a day when a series of quakes struck in the Pacific, the U.S. Geological Survey reports. 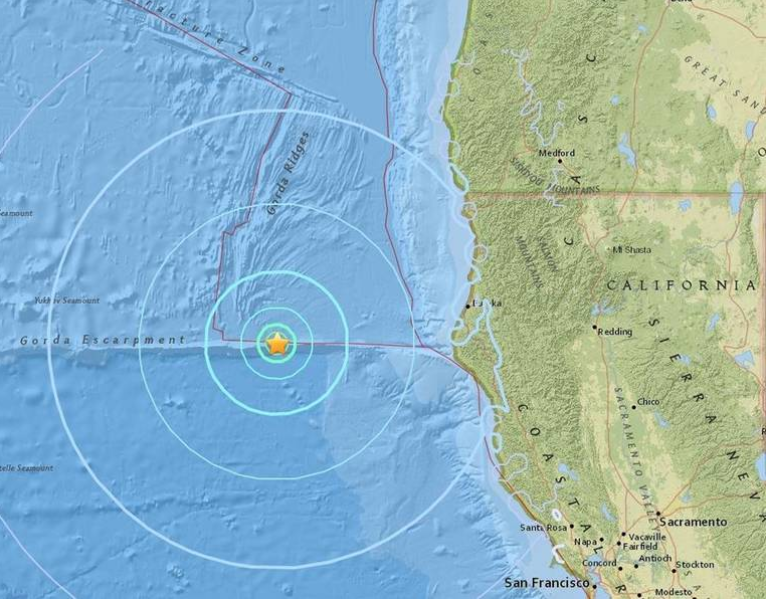 The earthquake was reported at 12:50 p.m., nearly three hours after a 3.3-magnitude quake was reported in the Pacific Ocean, about 49 miles west of Ferndale, according to the USGS. About 40 minutes prior to the 3.3-magnitude quake, a 3.1-magnitude earthquake struck in the Pacific, about 155 miles west of Ferndale. According to the Los Angeles Times, the larger temblor occurred at a depth of 2.5 miles, the USGS said. Three additional quakes were reported later, one of magnitude 3.1 about 1:30 p.m., a magnitude 2.6 at about 3 p.m., and a magnitude 3.9 about 4:20 p.m., according to the USGS. That made for a total of six temblors recorded in the same general area off the coast of California.